The curly coated retriever is a very active and eager dog. It is known not only for retriever skills on land, but also in water as well. When in the wild, this breed will run and play for as long as they will be allowed, but once indoors with its owner it is a very calm companion. Its gentleness makes it a great breed to bring around children. It can be trained with ease and listens carefully and behaves when given a command. If the curly coated retriever isn’t familiar with somebody it can be really reserved; however, once the dog gets to know the stranger, apprehensions fade away swiftly. This dog is extremely courageous yet very sensitive. These dogs will make great pets for active families who enjoy the outdoors. The upkeep of these dogs is fairly easy. They require exercise on daily basis and the recommended forms of exercise are swimming, running and playing ‘fetch’ to practice their retrieval skills. The curly coated retriever can live outdoors if there was no other option, but they really thrive in an indoor-outdoor atmosphere. This dog is known for its tight curls and if brushed too often, the curls will loose their form. This is why it is recommended to only brush them occasionally. The best time to comb these dogs is right before they get wet so combing before bathing them is the best option. Their hair does not grow at incredibly fast rates so occasional clipping will be just enough as well. Chronic Hip Dysplasia (CHD) is a disease that can be found within this breed. CHD is a disease that effects the dogs hip ball-in-socket joints. It can be treated with anti-inflammatory drugs, rest and in severe cases, surgery. Other health concerns that target the curly coated retrievers include distichiasis and cataracts. Distichiasis is an abnormal growth residing along the dog’s eyelid. Reasons why curly coated retrievers are prone to this are unknown. If your dog is scratching his eyes more than usual, it may be beneficial to get him checked out for distichiasis or cataracts. As for minor health concerns, this breed is generally overall healthy so it is important to keep an eye out for any major aforementioned health concerns. This breed will typically live 8 to 12 years if healthy. Curly-coated retrievers, also known as “Curlies,” have been retrieving for their owners since as far back as the 18th century. 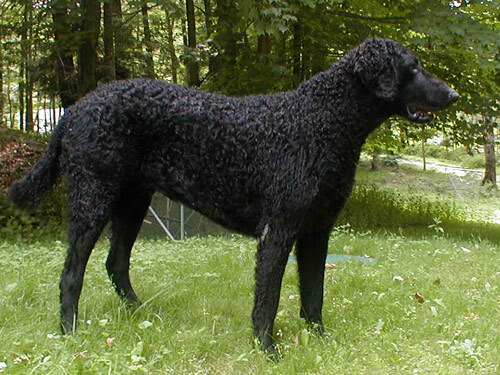 Although the actual DNA makeup of this dog is unknown, it is hypothesized that it is a descendant of the Old English Water Dog and the Irish Water Spaniel. By gaining the genes from these two water dogs give reason to the curly-coated retriever being such an exquisite water retriever. This breed was also the very first breed to be on exhibit at dog shows in England. They were first exported to America in 1907 and it wasn’t until 1924 when they were considered a true breed according to the AKC. Despite being exported to America, it never really gained true popularity in the states. Popularity of the breed even began to dwindle in England during the 1900’s. The reasons for this are suggested that perhaps Curlies who were rebellious were hard-mouthed retrievers, giving their hunting companions a harder time on the hunt. Overall, most Curlies tend to be soft-mouthed, but because of a few of them hunters began to choose other breeds to suit their retrieval needs.